Robert “Bob” Asherman died March 31 at Carriage Crossing in Champaign. Bob was born in 1928 in Dewey, the son of Frank and Lottie Asherman. He graduated from Champaign High School in 1947 where he was a member of the football and wrestling teams. He attended the University of Illinois. In 1949 he married his high school sweetheart, Eloise Bray. He joined the Marines and served during the Korean conflict. Surviving are his wife of 70 years, Eloise Asherman, Champaign, his daughters, Lynn Asherman (Hope)Greenwood, IN; Lori Ivey (Dan), Mahomet and grandson, Kenith Christensen, two great- grandchildren, Wyatt and Kaydence Christensen, and sister Carolyn Hinners (Charles). He was preceded in death by his parents and brother, John Asherman. He was an Illini and Bears fan, enjoyed golf and woodworking as a hobby. Together they spent many evenings ballroom dancing with their friends. 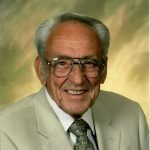 Bob was associated with R.H.Bishop Company for over 30 years. He was a member of Sheetmetal Workers Local #218, Champaign-Urbana Elks, Moose Lodge, Western Star Masonic Lodge, Mohammed Shrine, Illini Shrine Club and the American Legion. Morgan Memorial Home are handling arrangements. A private family burial will be held. The family would like to thank the staff at Carriage Crossing and Transitions Hospice for their care. Memorial contributions may be made to the Alzheimer’s Association in his memory. Condolences may be shared online at www.morganmemorialhome.com. Eloise, my deepest sympathy to you and your family. I enjoyed those Sunday evenings on “Sir Richard’s” patio with you and Bob, Stub, Joan, Ginny, and Jim. Miss all of them and those good times. But the memories are forever. Wishing you peace and comfort. Kathy.